Vietnamese authorities have arrested three women and a man for allegedly smuggling newborn babies to China. The suspects were detained with two baby boys, aged one month and one week old, in Hanoi and Ha Tay provinces. Hanoi police said they had also detained an eight-month pregnant woman who confessed to agreeing to sell her unborn baby to the gang. The woman was being transferred to China, where she is expected to give birth to the child. All the babies were sold for eight million dong ($500) each. The police said they would be offered for adoption to couples in China for around $2,000 each, because they were boys. Girls would be sold for half the amount, according to investigators. This is the first time the Vietnamese police have uncovered the smuggling of unborn babies. One of the boys has been returned to his birth mother, while the other is being looked after at a children’s hospital in Hanoi. HANOI — Vietnamese police have arrested four people this week for trafficking babies, including one yet to be born, for adoption inside the country or in China, authorities here said Wednesday. Hoang Duc Hien, 60, and his wife Tham Thi Hoa, 47, were arrested Sunday at a Hanoi bus station, where they were caught with two babies and a mother from southern Vietnam who was in her eighth month of pregnancy, police said. The pregnant woman had agreed to sell the unborn baby for eight million dong ($500) after the child’s father had abandoned them, a police officer said, confirming a report in the police-run newspaper An Ninh Thu Do. “This is the first time we have caught a human trafficking syndicate in a case where the baby was still in the womb,” the police officer told Agence France-Presse, speaking on condition of anonymity. Authorities believed the gang bought Vietnamese baby girls for $500 each and boys for $1,000 and sold them for about twice that amount, the police officer told AFP. Police Monday detained two more women, Nguyen Thi Thinh, 42, and Trinh Thi Nga, 27, who were also suspected members of the baby-trafficking gang. The infants have been handed over to local children’s hospitals, the police officer said. A group of Vietnamese children who have been adopted by families from the states are learning more about their roots, and it’s all thanks to a group of Smith College students.Every other Friday, 9-year-old Phoebe Jessup is a student at Smith College in Northampton. And her teachers are Smith students. The subjects this week are numbers and animals, all in Vietnamese. “It’s apart of who she is, and apart of who our family is,” says Nancy Jessup, Phoebe’s mother. 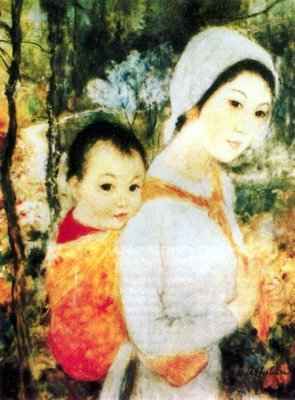 Nancy Jessup adopted Phoebe from a Vietnamese orphanage when she was 5-months-old. Once the adoption is official every family is ordered by the government to educate their new child about their Vietnamese culture. That’s when Nancy got in touch with Smith College and other parents, and the class was born. “They have games and videos and they have done some cooking,” adds Jessup. The group is made up of about 5 students. Some have lived in the states their whole lives, and others are new to the country themselves. They spend every other Friday teaching children about Vietnamese food, clothing, geography and more and they do it all on their own free time. This is another one of those smack-worthy sayings. It sometimes falls from insensitive people’s mouths when an adoptee talks about their adoptive parents in a less than glowing way. I’ve heard it said to other adoptees. People have said it to me when I’ve described what my father put me through. It’s annoying and shows a mind-blowing amount of ignorance and lack of thought. The ironic thing is that I and other adoptees have already described how many times we’ve had to tell people, “They are my real parents,” when asked if we know who they are. Personally, I no longer make that distinction as I feel that both sets of my parents are my real parents only in different ways. I will no longer be forced to chose between the two. Some will disagree with me, and that’s fine. I think the way an adoptee choses to personally define his or her familial ties should be up to the adoptee. Yes, I’m upset with my dad, my dad, not some person. I don’t need someone telling me who my parents are. Duh. Asian Adult Adoptee Gathering & Film Festival: Honolulu, October 2008 — Call for submissions! Entries will not be returned. For more information or for additional submission guidelines, please contact KAHI at info@KAHawaii.org, or visit http://www.KAHawaii.org/mini08. The Asian Adult Adoptee Gathering and Film Festival is a celebration of the range of experiences – from the unique to the unifying – found among the diverse diaspora and global community of adoptees of Asian descent. The Gathering and Film Festival are expected to draw upward of 100 visitors from Hawai’i and the mainland United States, and such international locations as Sweden, Denmark, Australia and South Korea. Now that’s a funny one. Kevin at Borrowed Notes posted a blog post that touches on guiltatude and one way in which is it used. This kind of gratitude/guilt-trip seems to be something many adoptees find cast upon them some time during their lives. In all honesty, I truly am “grateful” for the opportunities I’ve been given, but I no longer allow it to be used as a tool to (intentionally or otherwise) manipulate my thinking. Given the circumstances from which I’ve always been told I escaped, there’s a certain amount of survivor’s guilt as well. The combination of the two can do funny things to a person. Pulling from the files of TRA Sume 101 (because I’ve already mentioned this several times on my blog) – I sensed my parents’ reluctance to talk about my adoption in depth. My gratitude to them thus made me feel guilty about pushing the matter. It was my right to know, yet I felt guilty over pushing the matter. The burden of pretense that all was well was placed squarely on my young shoulders. I believe it was an unintentional, self-inflicted consequence of a combination of factors. The universal need for approval and acceptance from parents, love for them and the need to belong all had a role to play. True, those are usually involved in any parent/child relationship. However, add in the knowledge you were “saved” and are “different” from your parents, and I think it somehow doubles the effect. Even as a young child, I was under the impression that I had escaped something horrible. I knew what war and poverty meant, knew other children had been left behind and didn’t need anyone to tell me I was somehow “lucky” to have gotten out. I don’t remember my mother ever intentionally driving that point home, but she didn’t have to. Other people did that for her by telling me flat out how lucky I must feel. Yet even without that, television, movies, classroom lessons and my own ability to put two and two together would have sufficed. This kind of guiltatude was subtle and some might argue more dangerous in its effects on my young psyche, because it wasn’t obvious. Hopefully, we are past the days when adoptees are so blatantly subjected to manipulations of guiltatude. Anyone who does even a cursory check into adoptee literature will discover it just isn’t kosher to remind an adoptee of their “good fortune.” Still, as Kevin reminds us, the attitude still exists and can be used to justify guilt-tripping an adoptee. Appeal to the sense of obligation that’s often the result of guilt/gratitude in an adoptee and you can’t go wrong, right? Bad. For anyone out there reading this and thinking that it’s a good idea to tell adoptees (either directly or indirectly) of how fortunate they are and then try to use that to “recruit” an adoptee to your cause, I hope you think twice after reading this. If you’re out there helping people, I commend you. I would never think to demean someone’s dedication to helping others, but using guiltatude as a recruiting tool is manipulative, patronizing and may result in the exact opposite of what you want. I was aware of my “saved” status at an early age and didn’t need additional reminders from anyone. The total negation of the loss involved felt as if they’d just rubbed salt in my eyes. In his post, Kevin asks, “How much longer do we have to pay for your kindness?” I would also ask, “In how many ways?” When does the debt and assigning of roles end? Cultural bridges, anyone? And who is anyone to presume to consider it their privilege to assign those roles? I don’t care how many awards you have or how much you think people love you. The whole thing smells of a savior complex. Trish Maskew, President of Ethica, recently returned from Vietnam. While in Hanoi, she met with the U.S. Embassy staff, who revealed something that is terribly shocking and upon which Ethica feels compelled to act. U.S. Embassy staff revealed that approximately 85% of the children being placed for adoption now are reportedly abandoned. 85%! The Embassy strongly believes that most of these “abandonments” are in fact staged abandonments. And indeed, the history of the past 10-15 years lends credence to that belief. The importance of identifying information to adopted persons cannot be overstated. Every adopted person, no matter who they are or who they were born to should know their origins if at all possible. When adoptees for generations have discussed their pain about the lack of info, and their longing for more, there can be no doubt that for the children this is one of the most important things about any adoption. Indeed in the last 15 years there has been a huge push to open adoptions to address the harm that secrecy causes. And yet, in Vietnam evidence suggests that someone is depriving them of this most essential of life’s information. Who is doing it? We don’t know; there are several possibilities discussed in more depth below. It is our sincere hope that no agency or agency contractor is doing so intentionally, and we believe that not all, or even most, agencies are. But these questions must be answered. As mentioned on both Harlow’s Monkey and Borrowed Notes, Ethica has initiated a project “designed to encourage the accurate identification of Vietnamese orphans and to prevent skyrocketing abandonment rates from impacting the future of adoptions from Vietnam.” The jump in the number of “abandonments” should be an immediate red flag. To think some of these might have been staged in order to make things “easier” fills me with such outrage. As someone who’s only recently discovered the tangled web of lies and deception in regards to my own history and identity, I can’t help it. Even during the days when I thought my history was simply “lost,” I felt its absence like a constant presence in my life. It sounds crazy to say an absence is a presence, but I’m referring to “the void” left by my lack of access. Nothing was something and that something never went away. It wasn’t always a conspicuous part of my conscious mind but it didn’t have to be. The nature of the beast was subtle which made it all the more difficult to understand. Unknowingly, I’d shaped much of my life around the disconnect. Even more telling was how I’d tried to fill the emptiness. Again, that’s not to say that I attribute everything to the loss, but think it factored in much more than I’d previously thought. Over time, I tried to come to terms with the loss, but don’t think I ever really did. Coming to terms meant acceptance of its existence which is something I found impossible to do. Acceptance felt like saying my history and identity weren’t important and they were. Not having access to my history or a strong sense of identity only added to my feelings of being apart from my environment rather than being a part of it. Every illusion I’d construct for myself would eventually fall apart until I had no choice but to pursue the truth. To later learn that my adoptive father had not lost but in fact hidden an important part of my history wreaked havoc on my already weakened sense of self as well as our relationship. Once again, everything I thought I knew about myself was cast into doubt making much of my life feel like a lie. Despite any good intentions he might have had, his decision to hide and manipulate the truth felt like a betrayal. Like I’ve written, time and again, children do not stay children forever. And, one way or another, these children, when they grow older and become adults themselves, will hold their adoptive parents, agencies and foreign governments accountable for those decisions that ultimately affected their lives. Adoptees have the same fundamental right to know their origins. I can’t stress enough the importance of recognizing that right and ensuring that access to the truth is available when possible. Some may never want to know, but there will be many who will. Like Jae Ran, I sympathize with the long wait potential adoptive parents must endure but cannot ignore the recent warnings issued by the DOS. Those warnings combined with the jump in “abandonments” in Vietnam to a whopping 85% and the lack of transparency should send up a red flag that should at least be investigated. How can one not be concerned if there is the slightest possibility that a child is being put up for adoption through unethical means? As history shows in cases like Guatemala, without transparency and tight safeguards the potential for abuse and corruption is high. When I discuss adoptions from Vietnam in regards to my generation and the deception that was sometimes involved, people often explain it away using the “chaos of war.” Vietnam is no longer the “war-torn” country from where I sprung. Poverty and social pressure seem to have replaced war as the reason for the rise in abandonments. Still, some part of me finds it all a little too convenient. Given the lack of transparency, I think it at least warrants a thorough investigation. It would be sad to see the country of my birth replace Guatemala as the default country to cite during discussions of adoption abuses and corruption. We understand that a rumor is spreading that the State Department will require Vietnam to become a party to the Hague Convention before a new Memorandum of Understanding can be signed. We have confirmed with the Department of State that this rumor is false. As the U.S. is poised to enter the Convention, it is, of course, recommending that all countries become parties. Under the Convention, bilateral agreements like the one the Vietnamese government requires are not necessary. However, the U.S. is fully aware that the process of becoming a party to the Hague is serious and time intensive, and there is no expectation that Vietnam will become a party to the Hague before the current agreement expires in September. The U.S. will thus be conducting negotiations with Vietnam on renewing the MOU. 2. Cases in process on September 1. Families are understandably concerned about the recent State Department warning and are anxious for information about whether cases “in process” on September 1 will be completed by Vietnam, and further which cases are considered “in process” (for example, cases in which a dossier is logged in or cases in which a referral has been made). Ethica has spoken with the Department of State about these questions and we have requested that DOS seek a definitive answer from the DIA. We must continue to caution families that, at this time, no one can guarantee what will happen on September 1. Some families are reporting that their agencies have assured them that all families with dossiers in Vietnam on September 1 will be assigned a referral and completed. Some report that their agencies have received assurances or one sort or another directly from DIA. Ethica believes that such guarantees, even when made in good faith, are ill-advised in the current situation, and reminds parents that there have been endless conflicting reports about what DIA has said about several issues, including the practice of “umbrella’ing” and donations to orphanages. Therefore, families are cautioned against putting their faith in anything that is not an official announcement from the U.S. government that transmits what the DIA has decided about in-process cases. While such official pronouncements can also be changed at a later date if Vietnam were to choose to do so, an official announcement is a stronger indication of what will likely occur.